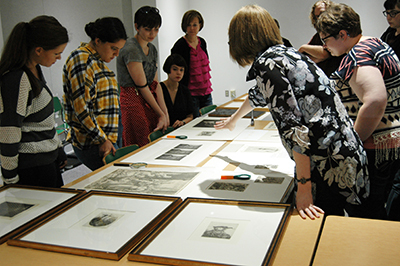 On Monday, September 14th, Visiting Assistant Professor Sarah Schaefer’s graduate colloquium, ARTHIST 760: Modern Print Culture: Objects and Audiences, had the chance to view prints from the UWM Art Collection. Students were introduced to the major printmaking processes by looking at works by canonical printmakers like Albrecht Dürer, Rembrandt, and Francisco Goya. The class was also able to see a bit of the printmaking process through examining two of Robert Von Neumann’s woodblocks and three different inkings from a plate etched by Rembrandt.